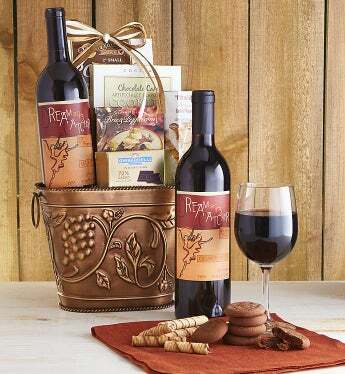 Red wine lovers will appreciate this beautiful embossed wine chiller gift basket. It features a delightful 2013 California red blend from Dream Catcher and an array of chocolates, sweets and savories. >A clean and elegantly structured wine that over delivers and rivals the finest Napa reds. This carefully curated gem pairs well with appetizers, strong cheeses, beef, pork, or poultry. It is rich and complex yet retains a fresh, crisp mouth feel. Harmonious and pleasant on the palate, a delicious fruit forward mouth feel with rich complexity and solid structure.